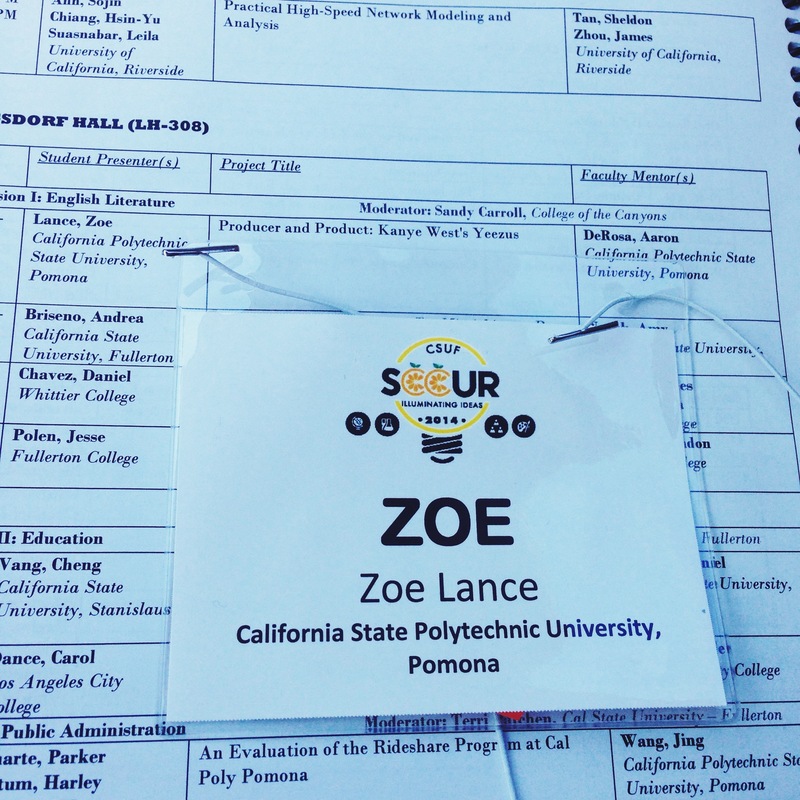 Capstone Adventures: Research Conferences – Zoë Lance. Over the weekend, I crossed an item off of the undergrad adventures bucket list: presenting at a research conference. I participated in the Southern California Conferences for Undergraduate Research at Cal State Fullerton at the suggestion of my capstone advisor, and I’m really glad I did. I gave a 15-minute presentation on my research on Yeezus to a semi-full room, which by my standards is pretty successful. I was the first student to present out of my four-person group, and some of the other student presenters in other groups came just to see mine and left after the second presentation. That was incredibly flattering. Of course, I learned a lot about presenting research and going to a conference. People are researching some really cool things these days. I didn’t get a chance to go see any of the presentations outside of my session, but the research interests in the program were incredibly varied: social psychology, education assessment, political studies and so on. When you’re in a specific discipline, it’s easy to forget a) about everything outside of it and b) other disciplines are just as dense and complex as yours. Presenting at a conference is A LOT of work. I suspect that most of the other students who presented at SCCUR were also using longterm research projects, because a 15 minute oral and visual presentation actually requires a significant amount of research. It took me three or four days to just decide on what I wanted on my PowerPoint. You have to have some kind of visual component. In the humanities, you don’t have to memorize your presentation. However, some of the other presentations I did see consisted just of the student reading their paper without any handout or PowerPoint. It made it incredibly difficult to catch the paper’s thesis and its idea map, and I realized just how important the visual component can be for comprehension. I really would have loved to have asked better questions after the presentations without visuals, but since I couldn’t follow the presentation, my questions weren’t very good. Having to get up in front of people and speak is actually a really good experience. Because I had never presented at a research conference before, I kinda expected the worst. No one was going to be able to follow what I was saying, my powerpoint wasn’t going to work on their computer, and I was going to flub all of my answers to the audience’s questions. Besides giving presentations for class, I had never presented my work to a group of people I didn’t really know. The idea of that is scary, understandably: you’ve put a lot of work into something, and strangers are going to critique it and ask questions you might not have the answers to. The night before, I was thoroughly stressed out. However, SCCUR wasn’t scored and therefore had very low stakes. It was really cool to have a low-pressure environment to start out in. I ad-libbed my presentation a little bit, and the only question I got was what had drawn me to research on Kanye West. I’m sure any kind of public speaking experience will serve me well in delivering story pitches or presenting at meetings. In that sense, participating in undergraduate research conferences are a great way to practice. And it was a reminder for me that the trivial things I worry about don’t ever happen, and that things always work out the way they’re supposed to. Have you had any research presentation experience before? Tell me about it in the comments. I really like that you posted this a day after I presented my paper at our mock conference. The fact that the mock conference gave me so much anxiety and seemed like it was going to be impossible to get through, I can’t imagine how nerve wrecking an actual presentation must be! It was definitely an interesting experience and as much as it terrified me, I’m glad I got to participate in something like that! Don’t worry Sarah, you’re gonna become a pro at giving presentations! Pingback: Undergrad Adventures: ENG 451 Presentation | Zoë Lance.